All my dolls are beautiful and full of character. I make them with lots of attention to detail. Each girl has her own detachable name tag in a small fabric bag tied to her wrist. Each boy has his own detachable name tag in a pocket on his trousers. All dolls can have any name of your choice (the card in the pocket says: 'Hello, I'm Carrie' (for example), or can have a personalised message, such as: 'For Amy with love'. I welcome custom orders so if you have a special request or enquiry, do email me. I have designed several variations on my lovely Jemima dolls, all of which can be purchased online. The most elaborate are £70.00. These are 56cm tall and either have a lace trimmed apron or they have lots of extra lace layers on the dress and underskirt. This design is the most intricate to make and takes longer. Secondly, I've designed a similar 56cm doll but with fewer details. Apart from the lack of an apron or the extra lace, these dolls are equally beautiful and have the same face and hair. Because they're less fiddly to make, this version retails at £55.00. My third design is a smaller doll, 44cm tall. As you can see from the examples in the photos, they're equally attractive, and have lots of lovely details but because they're smaller they retail at £40.00. In addition I make a 'slimmed down' version of the 44cm doll, which has the same lovely face and hair but I’ve omitted the extra details such as a necklace, apron or trims on the wrist and ankle. This version retails at £30. My boy dolls retail at £40.00. They're the same size (44cm), have cheeky grins and freckles, and lots of lovely details. There's one more doll design to choose from - it's my wonderful topsyturvy doll. She is, in fact, two dolls in one! One way up she's dressed in rags, with patches on her skirt, a sad face, and a headscarf. Turn her up the other way and her double sided skirt covers the 'rags' end to reveal the doll looking glamorous and ready to go to a Ball. As you can probably guess, I've used the Cinderella story as my inspiration for these dolls. The topsyturvy dolls are about 30cm tall but because there's so much work involved in making what effectively amounts to two dolls, they retail at £50.00. In 2018 I started designing a 56cm doll dressed as a bride, with a long white lace-embellished dress, lace-trimmed underskirt, a veil with flowers in her hair and a bouquet of flowers. I hope she will thrill anyone looking for a unique gift for a bride, for bridesmaids or for first communions. Of course she would delight anyone who loves beautiful dolls and would make a delightful present for any occasion. Because of the extra time it takes to make her, and the extra details, my bridal dolls retail at £90. Postage for my dolls is by Royal Mail 'signed for' delivery and costs £6.50 for delivery to UK destinations, and £12.50 to international destinations (for single items). You can buy my lovely Jemima dolls on this web site. I'm happy to make custom order dolls; just email me to discuss your requirements and to arrange payment. In addition to my range of rag dolls I have designed a Jemima rag doll starter kit, which includes everything required to make your own rag doll, except the needle and thread. I've tried out the kit on a willing volunteer who doesn't do much sewing and she found the instructions easy to follow. It helps if you have access to a sewing machine, but it isn't essential. My kits are suitable for anyone aged about 10 upwards. If you're interested, contact me by email and I'll make up a kit for you in your preferred colour scheme. The kit can be ordered direct from me by email (£20 including postage) or from my Shop page. All my rag dolls are made carefully and individually using traditional techniques with lots of attention to detail. They are all ‘one of a kind’. They are sure to bring lots of pleasure for a very long time. I make them at my home in North Yorkshire, which is a smoke-free and pet-free environment. They can sit up unsupported, although they prefer to have a surface to lean against. You can view a large number of my dolls in the Gallery. My aim was to put every doll I've made in the Gallery but that hasn't quite happened. I'm sorry if you've purchased a doll and there isn't a photo of it; I have to confess that I accidentally deleted some photos before posting them there. If you haven't purchased a doll yet, you can see a wide variety of the colours and styles I've made. My current policy is to post a photo of each doll I make as soon as it's completed both in the Shop and in the Gallery. I'm on to Rag Doll Gallery 2 now! If you see a doll in the Gallery that you particularly love and there isn't one at all similar in the Shop, contact me to discuss whether I can make one a bit like it as a custom order. If I have similar fabrics in stock it won't cost you any more than the Shop prices. I've designed my rag dolls to be decorative, ornamental collectables and keepsakes - perfect gifts for friends and loved ones. However, they are not toys: they have tiny buttons and other details which could be hazardous to very young children. My Jemima dolls will delight older children and adults, and they look wonderful displayed on a shelf, in a nook or cranny, or at the end of a bed, for example. So long as they are not treated roughly they will bring pleasure for years, and may well become delightful family heirlooms. My dolls have beautiful outfits made with new cotton fabrics, which are stitched on to the cotton fabric body. I stuff the body on the dolls with legs partly with polystyrene balls (which are fire retardant) and partly with new polyester toy filling (also fire retardant). This gives the doll a base which enables it to sit up nicely. The girls have bloomers (pantaloons) under their skirt. All dolls have hair of acrylic or acrylic/wool yarn. I suggest they are kept out of direct sunlight which could fade the lovely clothes in time, and please don't put them in the wash or tumble dryer. Recently I was asked to design a bridal doll. 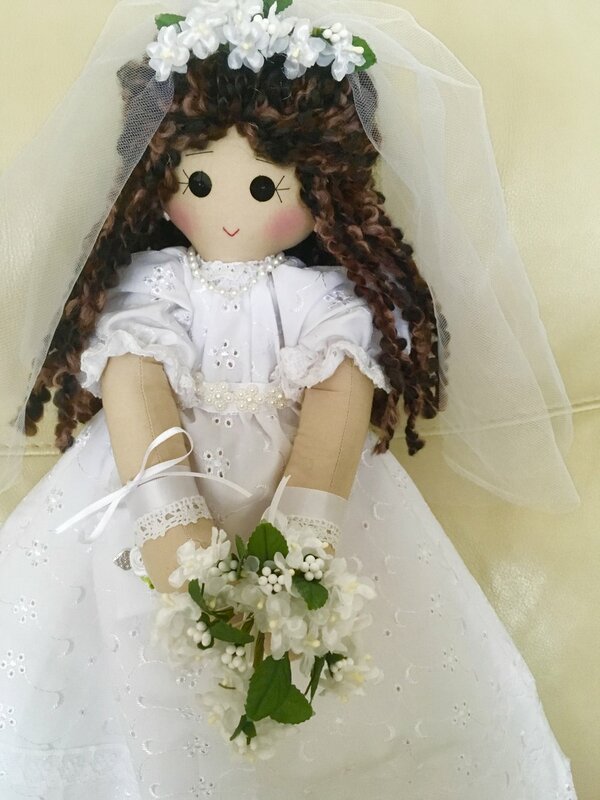 I have always hoped that a customer would request a doll dressed in bridal clothes, or request dolls for child bridesmaids to carry, made with the fabric of their wedding outfits. So I set to work, and I was very pleased with the result. I hope you agree. If you're interested in dolls for the special day, do get in touch! For more photos and info, go to News and Developments, March 2018. Chrissie is a beautiful black handmade rag doll with a salmon pink themed outfit. She has lots of lovely details such as sequins and buttons. She is a keepsake or collectable doll, not a toy, so is unsuitable for under 3’s. She would embellish any space such as a nursery shelf, a spare bed or chair. Her clothes are attached to her body and she will be loved by young and old alike. 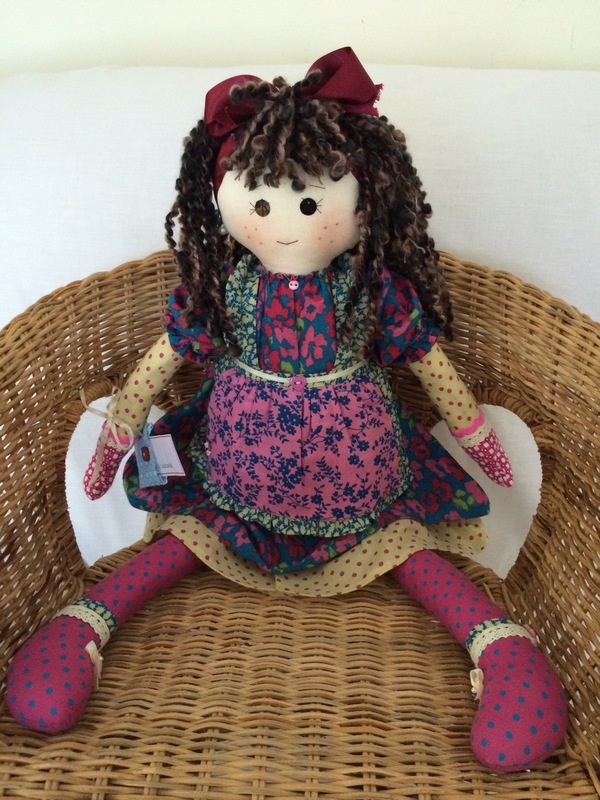 Amelia is one of my lovely 56cm (22") rag dolls, made with lots of love. She has lots of long red hair complementing her bright blue themed outfit. Whilst she is unsuitable for young children to play with because she has small parts (sequins, buttons, etc) she will be loved by young and old alike. She is a keepsake not a toy, and treated with care she will delight her owner for years to come. Her clothes are attached to her body. She has less details than my top of the range 56cm rag dolls, hence the lower price. Layla is one of my beautiful handmade and unique rag dolls. She has lots of lovely details such as a necklace, apron, ribbons and bows. I designed he r as a keepsake or collectable doll not as a toy. Her clothes are stitched to her body and she would look perfect on a shelf in the nursery or in any part of your home as part of the decor. She is very pretty and while I have styled her on a traditional rag doll I have added my own distinctive details so she has a modern look and I have used new fabrics, filling and yarn to construct her, which are fire retardant where possible. She is 44cm (17") tall and she can sit unsupported. 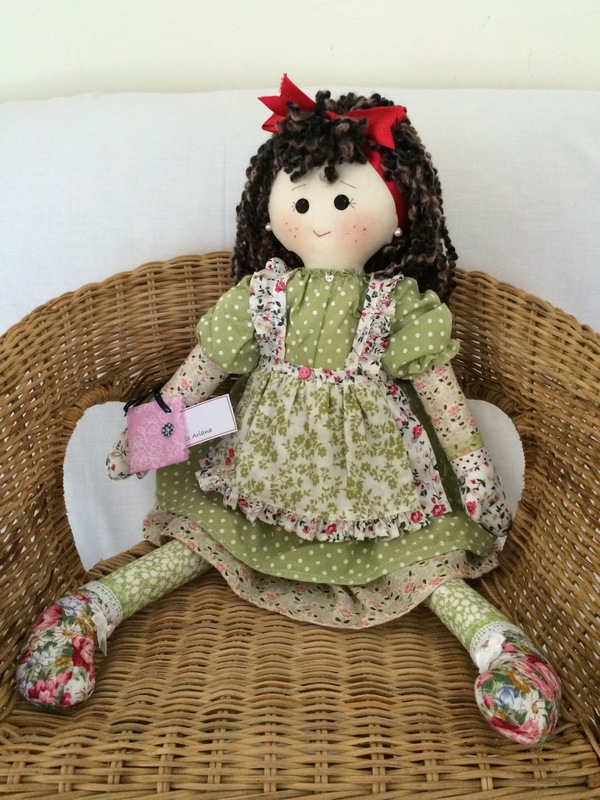 Darcey is one of my lovely 56cm (22") rag dolls, made with lots of love. She has lots of long red hair complementing her warm earthy tones themed outfit. Whilst she is unsuitable for young children to play with because she has small parts (sequins, buttons, etc) she will be loved by young and old alike. She is a keepsake not a toy, and treated with care she will delight her owner for years to come. Her clothes are attached to her body. I have gone to town on the details on this rag doll as she is one of my top of the range dolls. She has rows of lace on her dress, underskirt and apron; lace, buttons and bows on her shoes, and lace and buttons on her wrist. She can sit unsupported and will adorn a special place in your home. Fiona is one of my lovely 56cm (22") rag dolls, made with lots of love. She has lots of long fair hair complementing her pink and blue themed outfit. Whilst she is unsuitable for young children to play with because she has small parts (sequins, buttons, etc) she will be loved by young and old alike. She is a keepsake not a toy, and treated with care she will delight her owner for years to come. Her clothes are attached to her body. She has less details than my top of the range 56cm rag dolls, hence the lower price. Imogen is one of my beautiful handmade and unique rag dolls. She has lots of lovely details such as a necklace, apron, ribbons and bows. I designed he r as a keepsake or collectable doll not as a toy. Her clothes are stitched to her body and she would look perfect on a shelf in the nursery or in any part of your home as part of the decor. She is very pretty and while I have styled her on a traditional rag doll I have added my own distinctive details so she has a modern look and I have used new fabrics, filling and yarn to construct her, which are fire retardant where possible. She is 44cm (17") tall and she can sit unsupported. Joey is one of my range of cheeky boy handmade rag dolls. He is 44cm tall and features patterned trousers with patches, a felt waistcoat, tie and cloth cap. He is a keepsake, not a toy, and is unsuitable for young children to play with due to small parts, but he will be loved by young and old alike and will look great featured alone or alongside one of my girl rag dolls. Please choose your letter and enter it in the box below. On the next page you’ll be asked for both the letter and the swatch number. Each letter must be added to your basket separately. You are welcome to email me to discuss your order in advance, and I can send you photos of your chosen fabrics to ensure you're happy with the choice before I start making them. Andrea is a beautiful 44cm completely handmade, one-of-a-kind rag doll. Angela is one of my beautiful handmade and unique rag dolls. She has lots of lovely details such as a necklace, apron, ribbons and bows. I designed he r as a keepsake or collectable doll not as a toy. Her clothes are stitched to her body and she would look perfect on a shelf in the nursery or in any part of your home as part of the decor. She is very pretty and while I have styled her on a traditional rag doll I have added my own distinctive details so she has a modern look and I have used new fabrics, filling and yarn to construct her, which are fire retardant where possible. She is 44cm (17") tall and she can sit unsupported. Cordelia is one of my lovely 56cm (22") rag dolls, made with lots of love. She has lots of long fair hair complementing her purple themed outfit. Whilst she is unsuitable for young children to play with because she has small parts (sequins, buttons, etc) she will be loved by young and old alike. She is a keepsake not a toy, and treated with care she will delight her owner for years to come. Her clothes are attached to her body. She is one of my top of the range rag dolls so I have added lots of lovely details such as rows lace on her dress, underskirt and apron, and lace and buttons on her wrists and ankles. She can sit unsupported and will adorn any special space in your home. Shelagh is one of my beautiful handmade and unique rag dolls. She has lots of lovely details such as a necklace, apron, ribbons and bows. I designed he r as a keepsake or collectable doll not as a toy. Her clothes are stitched to her body and she would look perfect on a shelf in the nursery or in any part of your home as part of the decor. She is very pretty and while I have styled her on a traditional rag doll I have added my own distinctive details so she has a modern look and I have used new fabrics, filling and yarn to construct her, which are fire retardant where possible. She is 44cm (17") tall and she can sit unsupported. Bethany is one of my beautiful unique handmade rag dolls. She is 44cm (17") tall and can sit unsupported. She has many lovely details and is very pretty. She would look great on a shelf in the nursery or on a chair or window sill in any room in the home. She is a keepsake not a toy and is the perfect present for young and old alike. She is based on a traditional, classic rag doll but her clothes are all new cottons. She prefers to have a surface to lean against but can sit unsupported if necessary. Delia is one of my beautiful handmade and unique rag dolls. She has lots of lovely details such as a necklace, apron, ribbons and bows. I designed he r as a keepsake or collectable doll not as a toy. Her clothes are stitched to her body and she would look perfect on a shelf in the nursery or in any part of your home as part of the decor. She is very pretty and while I have styled her on a traditional rag doll I have added my own distinctive details so she has a modern look and I have used new fabrics, filling and yarn to construct her, which are fire retardant where possible. She is 44cm (17") tall and she can sit unsupported. Etta is a beautiful, unique handmade rag doll. She has lots of lovely details such as a necklace, ribbons, bows, lace and buttons. She is designed as a keepsake or collectable doll and is unsuitable for under 3's as she isn't a toy. She will however delight young and old alike and will look perfect augmenting any nursery or home decor. She is one of my 44cm (17”) rag dolls. Frankie is a beautiful handmade rag doll and she is completely unique. She is 44cm (17") tall and can sit unsupported. She is designed as a keepsake or collectable doll and would augment any home or nursery decor. She is not a toy and is unsuitable for under 3's due to the tiny details, but she will delight young and old alike. This gorgeous topsyturvy doll has two heads and can stand on her head! One end reveals her in work clothes and a sad face, the other end reveals her in a ball gown and a happy face. She is 30cm (12") tall and has lots of lovely details. She is not a toy and is unsuitable for under 3's but is designed for nursery or home decor. She will be loved by young and old alike. This delightful handmade rag doll is quite unique to Jemima & Co. Based on a traditional favourite, I have designed and created an upside-down or double-ended rag doll that will delight young and old like. She has the distinctive features of all my dolls but her combination of fabrics is unique to her. She is 30cm tall and has two distinct ends, so you in effect get two dolls. One end has work clothes and a sad face; the other end has a party dress and a happy face. One end is hidden from view by her long circular skirt while the other end is revealed. Her clothes are attached to her body. She is not a toy and is unsuitable for very young children due to small parts. I designed her as a keepsake or collectable doll, perfect for displaying somewhere in your home, such as a nursery shelf or spare chair. She is waiting for someone to love her! This delightful handmade rag doll is one of my ‘top of the range’ dolls. She is 56cm tall and has lots of lovely details such as a necklace, ribbons, lace, an apron, buttons and trims on her ankles, shoes and wrists, and a wrist bag for her personalised name. She is not a toy but will enthral young and old alike. She is unsuitable for very young children because of the tiny buttons and sequins and in any case, she needs to be treated with a degree of care. She is designed to grace any space in your home, from the nursery to the living room and she would look wonderful sitting on a spare chair or window sill. Her clothes are sewn to the body. She has the look of a traditional, classic rag doll but with modern, new materials. She is very pretty and I’m sure she would make a unique, fantastic addition to any home. Eddie is one of my lovely boy handmade rag dolls. He is 44cm tall and sports check trousers and a bright blue waistcoat. He has a cheeky grin too. He is not a toy, he’s a keepsake or collectable rag doll, which would look great on a nursery shelf or anywhere in your home. Because he has small parts he is unsuitable for very young children. He would also make a perfect companion for one of my 44cm girl rag dolls. I have made him completely from scratch so he is unique to Jemima & Co, and his outfit is unique to him. His clothes are attached to his body and they are made mostly of cotton fabrics. If treated with care he will delight young and old alike for a very long time. Brianna is a beautiful, unique handmade rag doll designed and created by Jemima & Co. She has been designed as a keepsake or collectable doll, not a toy and is unsuitable for young children to play with, but will nevertheless be loved by young and old alike. I designed her to reflect the look of a traditional, classic rag doll but with a modern look as well. She is 44cm (17") tall and can sit unsupported. Her clothes are attached to her body and she cannot be submerged in water. She would look perfect on the shelf in the nursery, or on a window sill or spare bed or chair anywhere in your home, and will become not only a focal point but also a talking point. She is just waiting for someone to love her as much as I do and give her a good home!! Aneena is one of my beautiful handmade and unique rag dolls. She has lots of lovely details such as a necklace, apron, ribbons and bows. I designed her as a keepsake or collectable doll not as a toy. Her clothes are stitched to her body and she would look perfect on a shelf in the nursery or in any part of your home as part of the decor. She is very pretty and while I have styled her on a traditional rag doll I have added my own distinctive details so she has a modern look and I have used new fabrics, filling and yarn to construct her, which are fire retardant where possible. She is 44cm (17") tall and she can sit unsupported. Liza is one of my beautiful handmade and unique rag dolls. She has lots of lovely details such as a necklace, apron, ribbons and bows. I designed he r as a keepsake or collectable doll not as a toy. Her clothes are stitched to her body and she would look perfect on a shelf in the nursery or in any part of your home as part of the decor. She is very pretty and while I have styled her on a traditional rag doll I have added my own distinctive details so she has a modern look and I have used new fabrics, filling and yarn to construct her, which are fire retardant where possible. She is 44cm (17") tall and she can sit unsupported. Juliet is one of my beautiful handmade and unique rag dolls. She has lots of lovely details such as a necklace, apron, ribbons and bows. I designed her as a keepsake or collectable doll not as a toy. Her clothes are stitched to her body and she would look perfect on a shelf in the nursery or in any part of your home as part of the decor. She is very pretty and while I have styled her on a traditional rag doll I have added my own distinctive details so she has a modern look and I have used new fabrics, filling and yarn to construct her, which are fire retardant where possible. She is 44cm (17") tall and she can sit unsupported. Brooke is one of my beautiful handmade and unique rag dolls. She has lots of lovely details such as a necklace, apron, ribbons and bows. I designed he r as a keepsake or collectable doll not as a toy. Her clothes are stitched to her body and she would look perfect on a shelf in the nursery or in any part of your home as part of the decor. She is very pretty and while I have styled her on a traditional rag doll I have added my own distinctive details so she has a modern look and I have used new fabrics, filling and yarn to construct her, which are fire retardant where possible. She is 44cm (17") tall and she can sit unsupported. Rachel is a beautiful unique handmade rag doll by Jemima & Co. She is 44cm tall and has lots of lovely details. She has been made with love to delight someone young or old, although she is not a toy and must be treated with care. She is really a keepsake or collectable doll and I envisaged that she would be placed on a nursery shelf, or on a chair, shelf or bed somewhere in your home. Her clothes are attached to her body and I have created her to resemble a traditional rag doll but with a modern colour scheme and modern materials. This delightful handmade rag doll is one of my 56cm dolls. She has lovely details such as an apron, lace, ribbons and a wrist bag. She is not a toy but will enthral young and old alike. She is unsuitable for very young children because of the tiny buttons and sequins and in any case, she needs to be treated with a degree of care. She is designed to grace any space in your home, from the nursery to the living room and she would look wonderful sitting on a spare chair or window sill. Her clothes are sewn to the body. She has the look of a traditional, classic rag doll but with modern, new materials. She is very pretty and I’m sure she would make a unique, fantastic addition to any home. Eleanora is one of my beautiful handmade rag dolls. She is 44cm (17") tall and I designed her as a keepsake or collectable doll, suitable for adorning a nursery shelf or part of your home decor. She has lots of lovely details, such as a necklace, ribbons, bows and lace. She has the look of a traditional, classic rag doll but with the Jemima & Co twist! Her clothes are attached to her body. She needs to be treated with care but will be loved by young and old alike. You can give her any name of your choice: if you let me know by email, at the time of ordering, the name you'd like, or a short personalised message such as 'For ...... with love', I'll put the wording on a small card in her wrist pocket. I'm sure she will give lots of pleasure for a long, long time. Upon purchase the dolls are gift wrapped and sent by guaranteed delivery worldwide.